This last post in the Useful Trading Tools series covers an intraday measure of the percentage of NYSE stocks trading above their day's volume-weighted average price (VWAP). Previous posts in the series have looked at the upticks/downticks among Dow Industrial stocks; stock market breadth; unique data visualizations; volume data; and NYSE TICK. 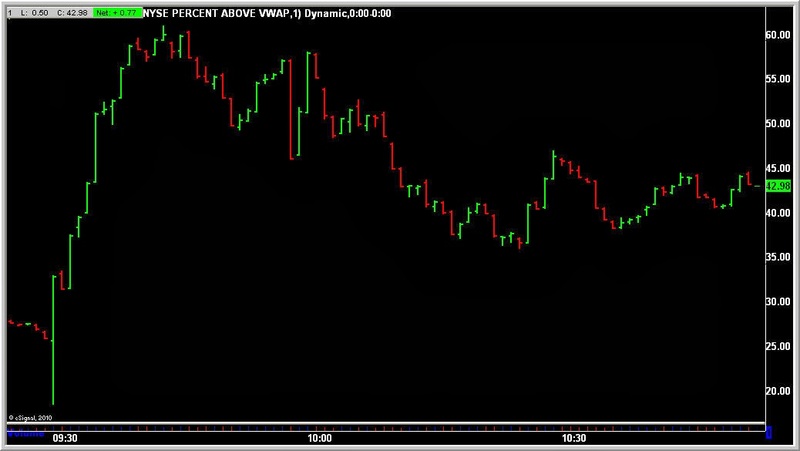 What makes the VWAP% helpful is that it is a real-time measure of breadth at an intraday level. In a trend day, we'll see the vast majority of shares either trading above or below their weighted average prices and stay at those elevated levels. In a range day, where we're likely to see sector rotation, we'll see more modest levels of VWAP% and often an oscillation above and below the 50% mark, as the above chart depicts. I get my VWAP% data from e-Signal. One can also construct VWAP% for Dow stocks only and for NASDAQ shares to get a sense for how large caps and tech-related shares are trading. It's a nice way to stay on the right side of the market: at a glance you can see if we're trading in a way that is trending and directional versus mixed and rangebound. Why Don't I Trade My Plan When I Plan My Trade? Should I Seek a Trading Coach?